The T2-102 Portable LED screen support can hold screens and monitors up to 65″, or up to 130 lbs. This LCD TV stand is a perfect addition to any lobby monitor displays, display kiosks, and digital menu boards and acts as an extra way to promote your products and company with digital advertisements. 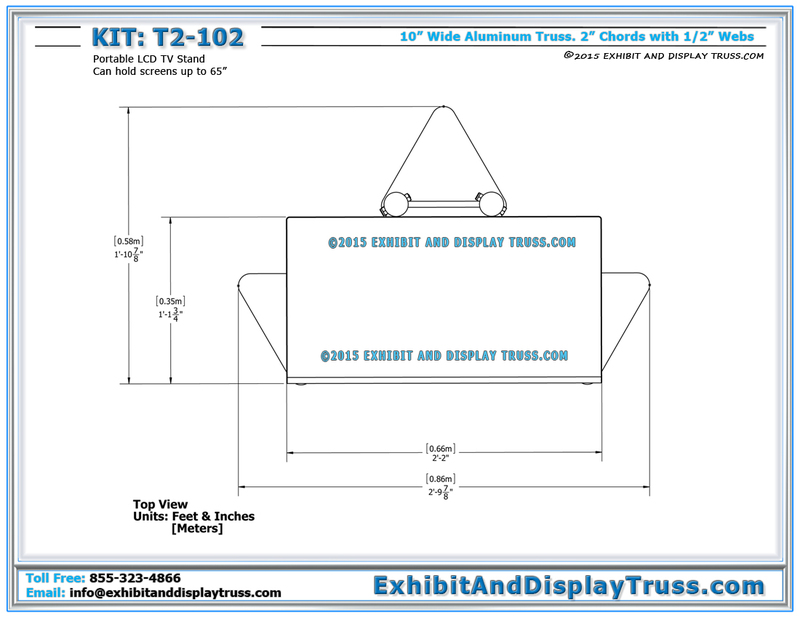 This can be used independently or with any existing trade show display. 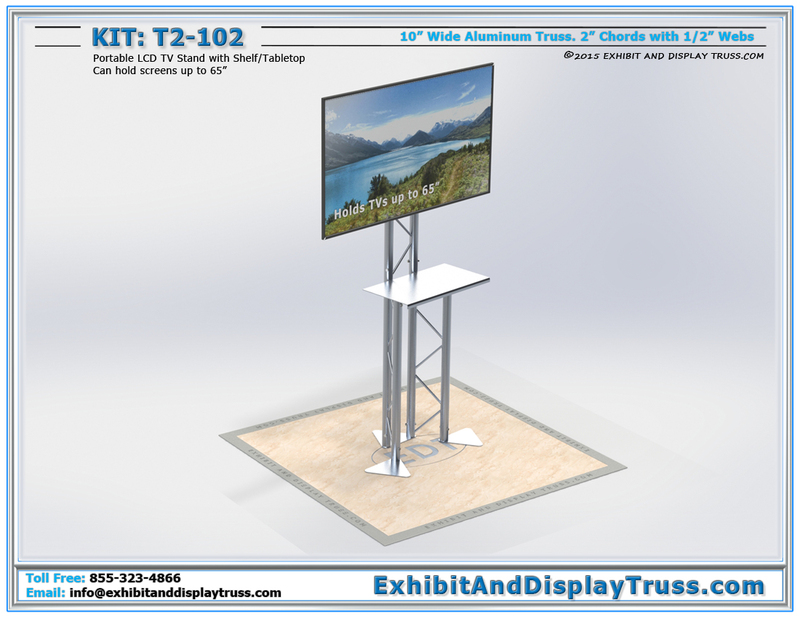 The portable T2-102 can be modified to suit any size of exhibit and display booth, making a perfect addition. The T2-102 Portable monitor stand is perfect for companies that are constantly on the go and travelling, with its ability to pack down quickly and efficiently. This monitor stand is perfect for conference walls. It also comes with a removable tabletop for a laptop kiosk, ipad kiosk, and as a place to display promotional material. Available with optional LCD TV mounts. Note: This stand does not come with the TV Mount. TV mount can be purchased here. 10" Wide Aluminum Truss • 2" Chords / 1/2" Webs • 43.2 lbs. All of our Trade Show Truss Systems are fabricated with the best materials and professionally crafted to provided a lifetime of operation. If you cant find what you are looking for, we can custom fabricate parts to suit your needs. Exhibit and Display Truss offers a wide variety of aluminum truss parts and exhibit display booth designs. 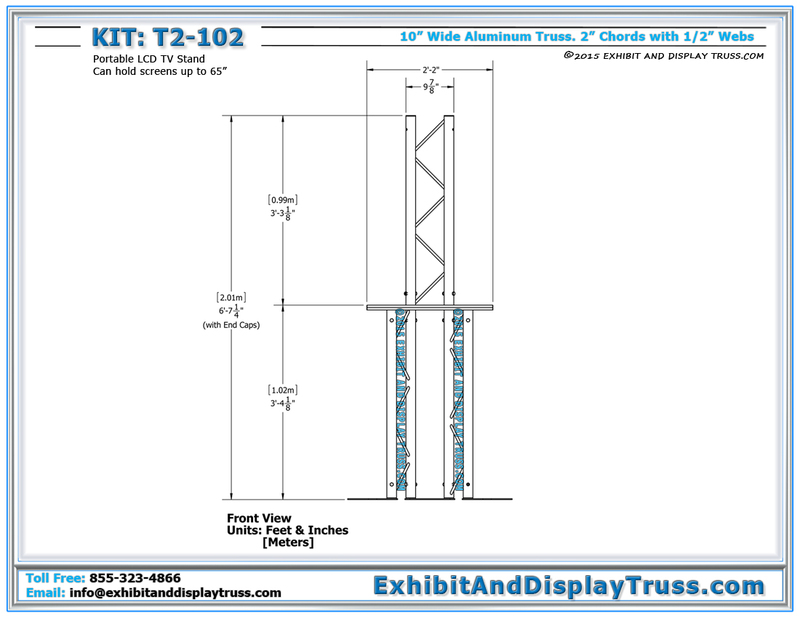 Exhibit and Display Truss has the ability to build custom parts and kiosk designs if your project requires unique configurations. 1″ and 2″ tube connection inserts (and hardware) come standard with each truss part, allowing for a quick and easy assembly. Truss components are constructed of square, triangular or flat pieces. 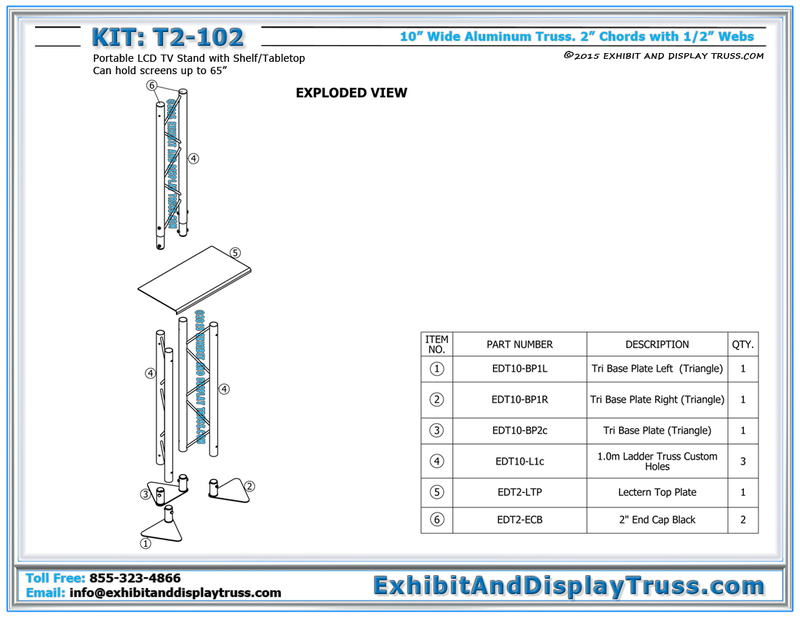 Exhibit and Display Truss offers three different truss profiles, 10 inch, 12 inch and 6 inch display trusses. All of our truss structures are designed for ease of assembly and available in a number of designs and sizes. 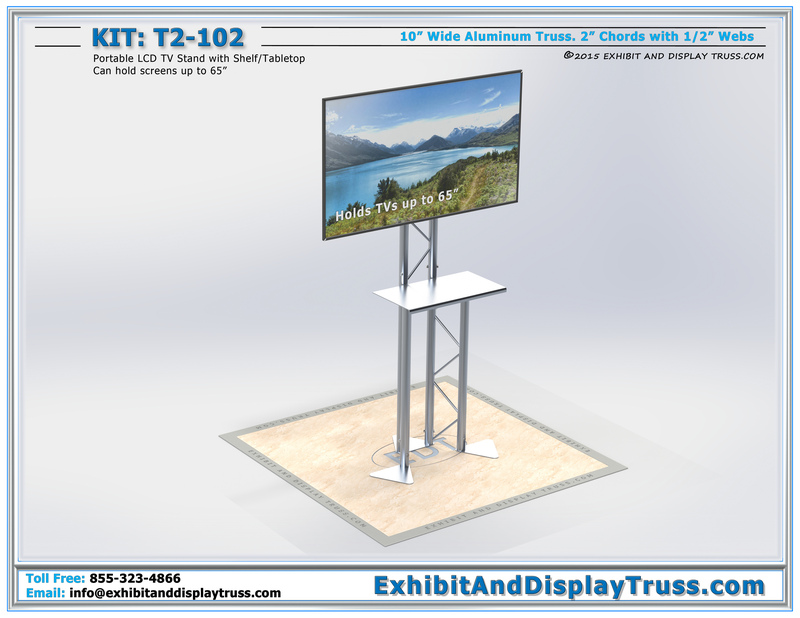 Our tradeshow tabletop displays are constructed of durable, high-strength aluminum and steel for supporting LCD or plasma screen mounts, banner stands and sign frames, lighting truss displays and other marketing accessories and advertising. Aluminum truss is the perfect choice for modular aluminum truss systems, perimeter booths, portable archways, finish lines and truss starting lines, lecterns and podiums, and just about anything you can think of. Let us create your beautiful displays today! Our truss display booths are designed to be set up fast and easy. Our truss systems use either a 2″ tube connection insert system or a 1″ tube connection insert system. For a very fast set up without any tools, quick clips can be used instead of the standard nuts and bolts for any truss system using 2″ chord/tube size. Find the right product or have questions just let us know, we're always here to help.